It was never going to be easy; heading out on my first decent run since being ill. So, I figured the best thing to do was to run some where pretty! Sherwood Pines is a Forestry Commission run area right in the heart of Sherwood Forest – Robin Hood Country! It is located in North Nottingham and I have spent many happy hours there, walking, running and mountain biking. Having been ill for a couple of weeks I have tried to ease back into running this week. A few short and steady outings seemed to have gone well, so I wanted to up the mileage slightly. My sister in law (Emily) is around for the weekend and we always enjoy running together. I suggested Sherwood Pines as it is lovely to get off road and into the trees. There are lots of well maintained tracks and paths, as well as the marked cycle routes. A group of us headed over; my Dad bought the dog along to take her for a walk and Sian, my sister, loaded hers and Jamie’s road bikes so they could cycle back. We parked up and piled out of the car. It was a pretty fresh morning so we were all keen to get going on our respective activities as quickly as possible. Sian and Jamie unloaded their bikes from the roof rack and set out on the ride home – via The Final Whistle in Southwell! Dad set off with Sprite and Em and I chose to see where the paths took us instead of following a set running route. Sherwood Pines have recently introduced a Wild Running trail; a 5km signed path through the woods. There is also a Park Run from here; both are fantastic additions to the set up. Em and I had agreed on a seven to eight mile, steady run and we set off gently, chatting away. We ducked onto various trails, sometimes following the Wild Run, sometimes footpaths and occasionally into the undergrowth when paths ran out. As we ran various birds dived across our path, gathering food for their winter strength. Despite the fact the car park and visitor centre had been very busy, as we headed further out, we saw few people. At one point we rounded a bend to a stunning avenue of towering pine trees, sun streaming through and throwing colours everywhere. Shall We Walk For A Second? My sense of direction is pretty terrible and I could have easily got lost in the woods but we would often come across signs for various trails. They were arrowed and numbered, so you always had an idea of where you were in relation to the main car park. We found ourselves looped back to the car at around five miles. Despite some clear reluctance on both parts, we knew we needed to head out and go a little further. It was good to catch up with Em and chatting always makes the run go quicker. Our limit was reached (or maybe just mine) at six miles. Finding ourselves back near the car park we called it a day. Dad had arrived back, with Sprite, just before us. Popping into the café to grab a drink I found it packed as usual. A fantastic mix of families, couples and friends, all warming up after spending time in the forest. We may not have run far. We may not have run fast. But we could run. Apart from parking, it was free. We were free. Sometimes it is good to remember how lucky you are and how little money you need to enjoy time outdoors. There is such a variety of things to do at Sherwood Pines. Last year I bought my Mum a mushroom and fungi identification day there! She loved it although I haven’t seen her out foraging lately. Open air concerts are also popular on the site. Bring a picnic and see your favourite group in a big clearing in the woods. Many a muddy hour has been passed with friends on the bike trials – despite me being a poor mountain biker. 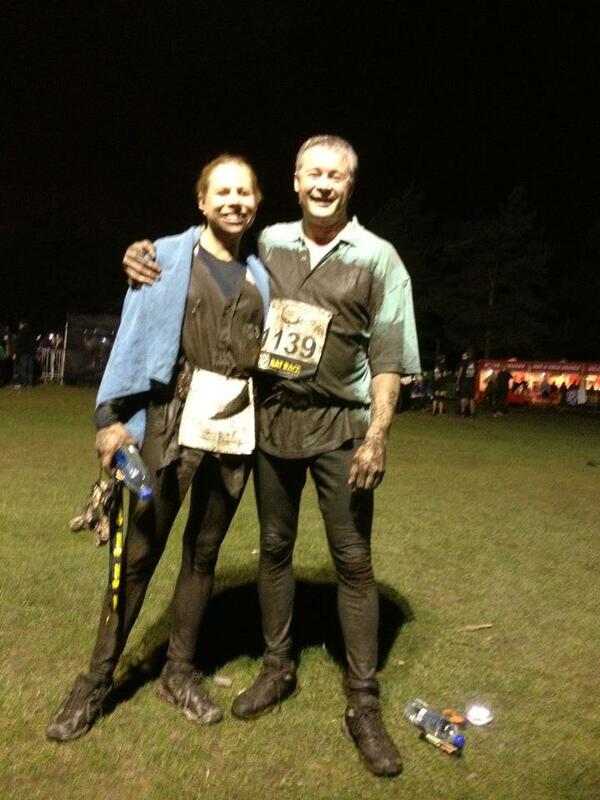 Years ago I visited for a night time 10k run; think head torches, mud and smiles. Don’t forget to look out for the wildlife; a magnificent stag once leapt across my path there. Next Post Everyday Exercise – It Doesn’t Have To Hurt!